[caption id="" align="alignnone" width="300" caption="Milton Chen, Education Nation"] [/caption] This lovely book has just arrived through the post. 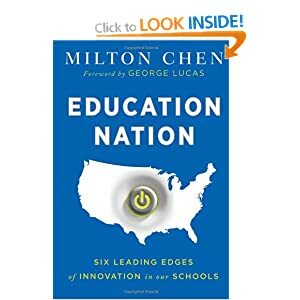 The author is my good friend Milton Chen, former executive director and now senior fellow at the George Lucas Educational Foundation (GLEF). Those with a long memory may recall that George Lucas, the Star wars director, spoke about Glow at the US House of Representatives in 2008 suggesting that there might be some lessons to be learned from the vision of the Scottish Government and the strategic. Another good news story for Glow in this morning's 'Scotsman' newspaper. Fiona McLeod notes that the capabilities of Glow 'are proving to be out of this world for teachers who can use it find free resources and materials for school projects as wide ranging as The Vikings to the planets.' Lots of great stuff beginning to happen using Glow - some of which we could never have imagined when developing the idea. We still need to work hard to make sure that every learner and teacher in Scotland has the opportunity to take full advantage of what Glow. There is an article by Melanie Reid in this morning's Times Online covering George Lucas' testimony to the US Congress. Under the headline 'The Force is with Scotland's School's intranet, says George Lucas' the articles goes on to say: 'In what must rank as one of the most heady compliments ever given to an education system, the film maker announced to members of the US House of Representatives that America should adopt Scotland's pioneering school websites as a way to improve pupil access to technology.' (:. This one really made me smile :) George Lucas mentioned Glow in his testimony before the US Congressional committee on telecomm and the Internet a couple of weeks ago. His testimony (6 pages) makes really good reading but the mention of Glow is on page 5 for those of you who are impatient..